Major League Baseball and the MLB Players Association are working toward a Thursday deadline to expand the playoffs by adding two additional Wild Card teams overall, creating a one-game first-round playoff in each league, beginning with the 2012 postseason. The new format was set late last year for a 2013 inception in the new five-year Basic Agreement between the owners and union. The two sides had a deadline of about two months to negotiate the logistics of beginning it a year early. A report on Wednesday that the deal is nearly complete could not be confirmed. A highly placed source said negotiations between the two sides were ongoing and that work still had to be done. The agreement expands the Wild Card by adding two additional teams, one each in the American and National Leagues. The three division winners in each league would await the survivor of the one-game Wild Card playoff, establishing the Division Series field. The subsequent DS, League Championship Series and World Series formats would remain the same. This has been the logistical problem: The regular season ends this year on Wednesday, Oct. 3, leaving only two days for travel, weather problems, plus season-ending tiebreakers for division titles and Wild Card berths and the Wild Card play-in games prior to the start of playoffs on Saturday, Oct. 6. The World Series is slated to start on Wednesday, Oct. 24. This year’s schedule was long set before collective bargaining ended with a new agreement on Nov. 21. The expanded playoffs were linked this past November to the sale of the Astros by Drayton McLane to Houston businessman Jim Crane and their move from the NL to the AL, effective for the 2013 season. The Commissioner’s Office and the union collaborated on those developments during last year’s months of collective-bargaining negotiations. The Astros’ shift from the NL Central to the AL West will give each league 15 teams and all six divisions five clubs. MLB has been studying how to expand the playoffs for at least two years, and it became a hot topic of discussion in Commissioner Bud Selig‘s 14-man special committee that has been studying on-field improvements of the sport. The playoff and realignment matters had to be collectively bargained because they involve scheduling, and the union made it clear that any playoff expansion would be tied to moving a team from the six-team NL Central to the four-team AL West to create better competitive balance. Michael Weiner, the union’s executive director, ultimately said that the playoff expansion wouldn’t have happened without the Astros’ move into the AL. 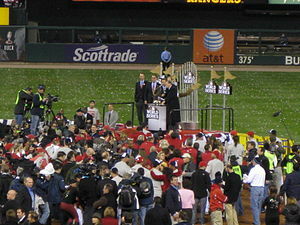 The current Wild Card format and three divisions in each league were adopted in 1994. From 1969-93, there were two divisions in each league and a League Championship Series between the first-place teams as a prelude to the World Series. Prior to 1969, only the pennant winners in each league met in the World Series. The new format means that 10 of the 30 teams make the postseason. The additional Wild Cards will place a premium on winning the division title for several reasons: The division winner will get at least a couple of days to breathe before the start of each Division Series, plus it won’t have to burn up perhaps its best starting pitcher to win a play-in game. Barry M. Bloom is national reporter for MLB.com and writes an MLBlog, Boomskie on Baseball. Follow@boomskie on Twitter. This story was not subject to the approval of Major League Baseball or its clubs. This entry was posted in Headlines and tagged Bud Selig, Division Series, division winners, Drayton McLane, Major League Baseball, mlb, Wild Card, World Series by Charles Oliver. Bookmark the permalink.